TAANAYEL, Lebanon (AP) — In a story Sept. 20 about Lebanon’s national drink, arak, The Associated Press incorrectly spelled the name of one of the country’s largest arak producers. The name is Domaine des Tourelles, not Doumaine de Tourelles. TAANAYEL, Lebanon (AP) — Every part of Lebanon’s national drink, arak, is infused with tradition — from distilling the aniseed-tinged liquor to the ritual of mixing it at the table, when the transparent liquid suddenly turns milky white as water is added. Arak is a staple of big Sunday meals. With a sweet taste and high alcohol content, around 40 percent, it’s best consumed with food — lots of it. That makes it perfect for Lebanon’s traditional meze, spreads of never-ending small dishes that family and friends linger over for hours. Aficionados say arak is vital to digesting the homemade raw meat dishes that are central to a meze. The real impact comes at the end of the meal, when you stand up after all that eating and the alcohol from glass after glass really hits. But the tradition is facing competition in Lebanon as young generations opt for liquors like vodka or whiskey that are easier to mix and drink — without a meal. Arak is comparable to Greece’s ouzo or Turkey’s raki, which are also grape-based drinks with the licorice-like flavor of anise. Lebanese say arak is smoother. Many families make it at home, each boasting their particular flavor and kick. Restaurants often serve both commercially produced versions and homemade varieties, known as “Arak Baladeh.” Regulars usually opt for the homemade. With so much home production, it is hard to tell how much arak is made. Lebanon’s Blom Bank estimated in 2016 that around 2 billion bottles a year are produced in the country, with nearly a quarter of it exported, mostly for Lebanese expats yearning for their local drink. 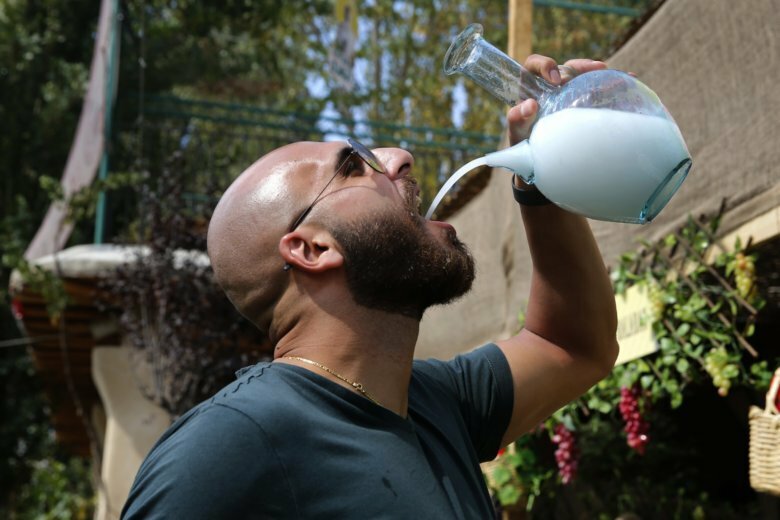 At a recent festival in Taanayel, a town east of Beirut, several commercial companies and smaller boutique houses showcased their araks in a celebration aimed at promoting the drink to the young. Christiane Issa, whose family owns one of Lebanon’s largest arak producers, Domaine des Tourelles, said the drink is a natural digestif. It was a nod to Lebanon’s growing market for holistic and natural products. “The most important thing about arak is that our grandfathers used herbs to treat illness, not medicine. They believed in herbs, so they chose to make arak with green anise because it has anethole, a compound that aids digestion,” said Issa, the company’s administrative manager. Some Beirut bars have introduced an infused version of arak, adding a twig of basil or rosemary, to attract young drinkers. Issa suggests watermelon. Passions run strong over every detail of arak tradition. It is to be drunk from small glasses — bigger than a shot glass but smaller than an Old Fashioned glass — arranged on a tray at the top of a table laden with meze. A new glass is used with each new serving. Some prefer to drink it in a tall glass. It is often mixed in a traditional glass pitcher, round with a short beak-like spout. That makes it easy to drink straight from the pitcher when the party really gets going. Drinkers staunchly debate the best way to mix. Some prefer half water, half arak — a strong, sweet mix, usually not for the newbies. More common is one-third arak to two-thirds water, to prolong the drinking and the gathering. The ice cubes are another discussion. For some, the glass is filled with ice cubes first before pouring the drink. Those truly religious about the drink insist that ice must come last. No one can clearly explain the difference, but theories abound. Some say arak is further weakened if the ice is already sitting in the glass. Others say, don’t question tradition. The making of arak is a family affair, with secrets passed from one generation to another. Central to the process is a triple distillation using a still called a “karakeh” in Arabic. The harvest is in September and October. The grapes are crushed and left to ferment for three weeks. The mix is then put in the lower part of the karakeh, where it is heated until it evaporates and cooled in the top part by a stream of cold water. At this stage, it is pure alcohol. Anise and water may be added in the second or third distillation. The mix is what makes each house’s taste unique. Homemade arak usually goes straight into gallon containers after distillation, ready for drinking. In commercial production, the arak sits in clay jugs for a year, making it smoother, Issa said. “Wine ages but arak rests,” Issa said. Issa’s father introduced a new technique, letting it sit in the clay jugs for five years before going to market. Her family bought Domaine des Tourelles 18 years ago and now it produces 350,000 bottles a year of Arak Brun, named after the Frenchman who founded it in 1868. At the Taanayel festival, visitors sipped on the sweet drink with their meals. He said with so many producers, arak can only get better.